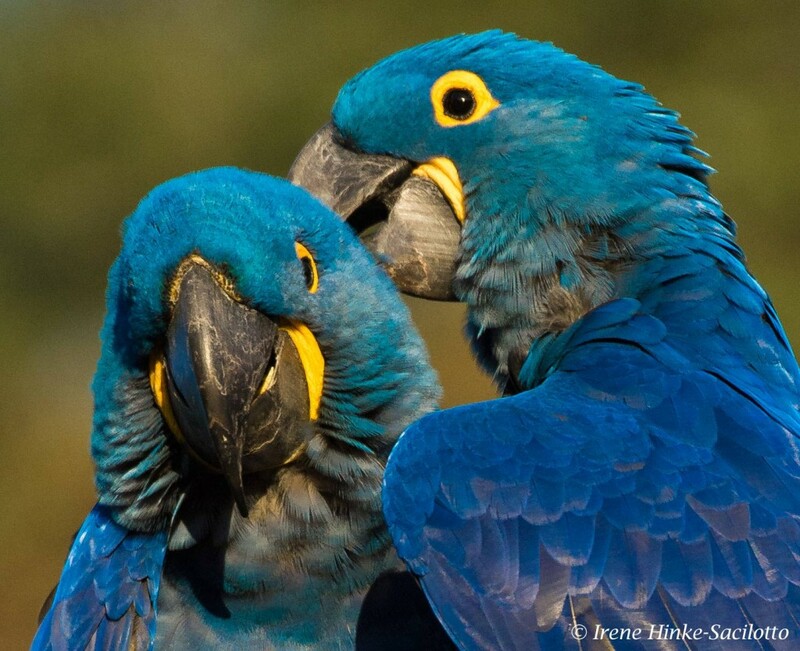 The Pantanal of Brazil is a UNESCO World Heritage Site. Why is it unique? The Pantanal is huge gently sloping basin and the largest seasonally flooded tropical wetland. It is10 times the size of the Everglades and is a mosaic of habitats created by water with distinctive wet and dry seasons. 80% is submerged during the rainy season, the months November through March. The nutrient rich floodwaters deposit sediments that enrich the soil and create a fertile environment capable of supporting highly diverse collection of plant and animal species. It’s home to some of the rarest animals on earth–the jaguar, marsh deer, giant river otter, hyacinth macaw, crowned solitary eagle, maned wolf, giant anteater, South American tapir, yellow anaconda, and yacare caiman. They share the habitat with howler monkeys, capybara, toucans, parrots, iguanas, armadillo, tegu lizards and other wildlife. It is estimated that there are more than 3500 species of plants, thousands of invertebrates, and hundreds of bird, mammal and reptile species. 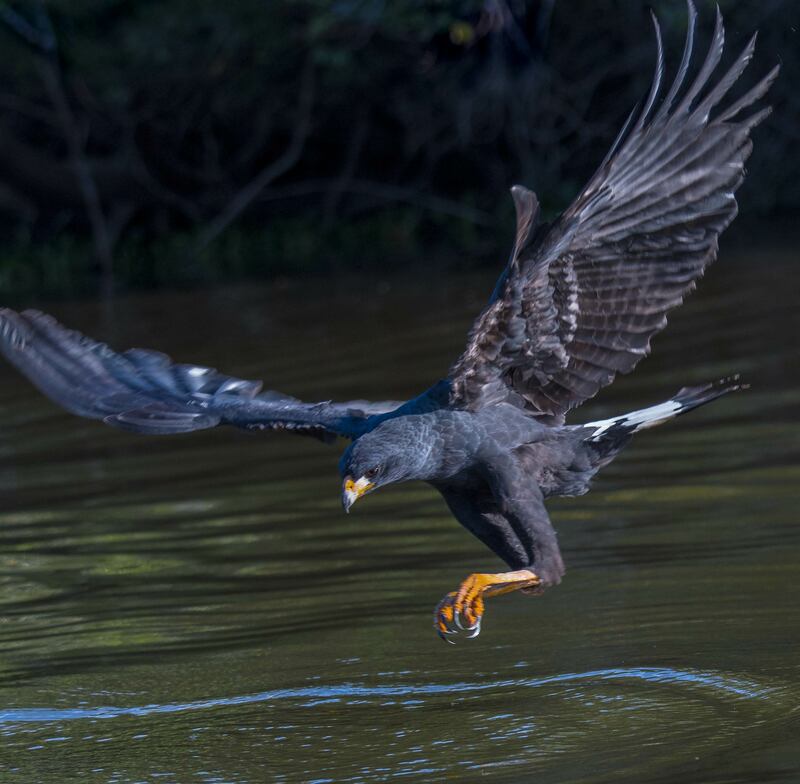 In addition to benefiting wildlife, the Pantanal is important for flood abatement, water purification, recharging ground water, climate stabilization, and serving as a nursery for aquatic life. Wet Season: The rainfall is approximately 1,000–1,400 mm (39–55 in) per year. But the majority of the water comes from runoff from the surrounding upland areas including the Paraguay River and its tributaries flowing from the surrounding plateau. As water levels rise, these rivers inundate the Pantanal’s grasslands and gallery forest, creating a vast temporary wetland bounded by dry and humid forests, grasslands, & savannas. During the rainy season water level rises 2 to 5 meters. Dry Season: May to late November is considered the dry season in Pantanal, and the water level drops dramatically. In November, very little of water persists except in some ponds and permanent rivers and streams. Tourists visit primarily June through Oct. 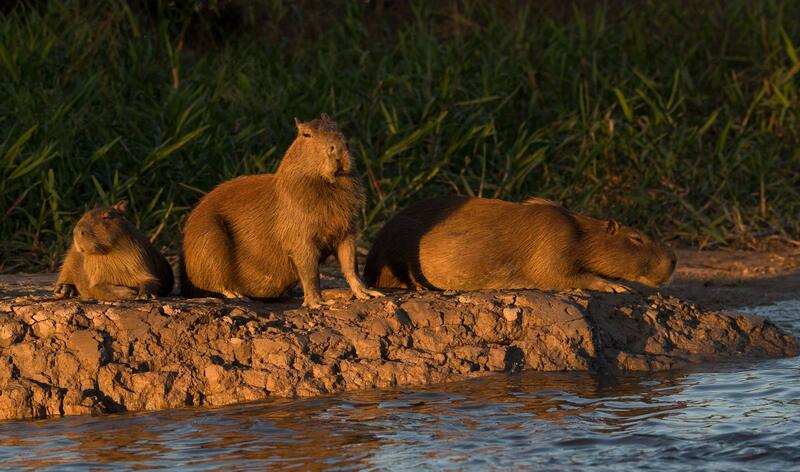 The average temperature in the Pantanal is 25 °C (77 °F), but temperatures can fluctuate from 0 to 40 °C (32 to 104 °F). The main gateways into the Pantanal are the cities of Cuiabá (capital of the state of Mato Grosso) and Campo Grande (Capital of the state of Mato Grosso do Sul). The Transpantaneira Highway is an elevated 160 km long dirt road. With dozens of bridges, many of them wooden, it crosses the Pantanal over savannahs, lakes, seasonal streams, rivers, lagoons, marshes and shrub wetlands until finally reaching the Cuiabá River where it ends at Porto Jofre. Along the way, there are many opportunities for roadside photography of wildlife. Economy: The economy of the area is based on cattle ranching, agriculture (rice, soy beans, corn, sugar cane, etc. ), agroindustries, mining (gold, diamonds, iron, manganese), professional fishing, sportfishing and eco-tourism. Concerns: Approximately 99 % of the Pantanal is privately owned with thousands of ranches (fazendas) and 8 million cattle. Current threats to the ecosystem include hunting, poaching (exotic species trade), pesticides from agricultural runoff, pollution from sewage and mining, and infrastructure development effecting hydrology. But compared to the Everglades, it is relatively untouched despite the lack government protection. 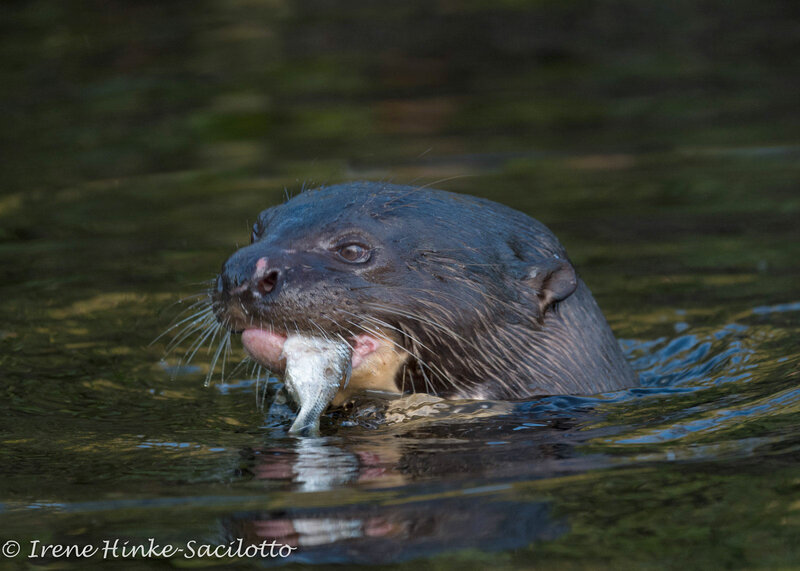 Giant River Otter eating fish.